If you're looking for an easy way to prepare a one dish meal, it's hard to beat a hearty casserole that combines meat with other tasty ingredients. Casseroles taste just as great as they are easy to prepare. 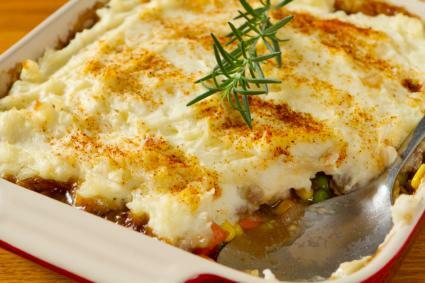 When you prepare either of the two casserole recipes presented here - Shepherd's Pie and Creamy Pasta and Beef Casserole - dinner is sure to be a hit with everyone in your household! Place ground beef in a large skillet over medium heat. Crumble meat as it cooks, stirring frequently until browned. When meat is cooked, drain excess fat away. Return meat to pan over low heat. Place potatoes in boiling water. Stir and mash until mixture is well combined and fairly smooth. Spray a 10 x 13 baking dish with nonstick cooking spray. Place meat and vegetable mixture in the dish. Spread mashed potato mixture over the top evenly. Cook pasta per instructions on package. Drain the pasta when it is cooked. 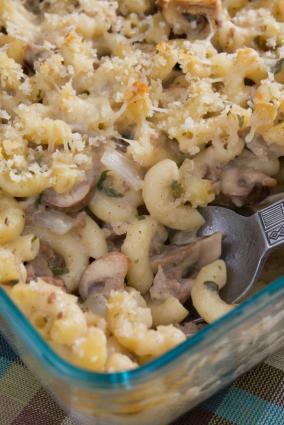 Place the drained pasta in a 10 x 13 casserole dish that has been sprayed with nonstick cooking spray. Place the beef, onion and minced garlic in a large skillet over medium heat. Add the mushrooms, tomatoes, soup and corn. Simmer for 5 - 10 minutes, just until heated through. Pour the meat mixture into the casserole dish. Stir gently to evenly distribute pasta. Remove foil and bake for an additional 15 minutes. Meat casserole recipes are so popular because once you put the ingredients together, the hard part is done. Unlike some dishes where you have to hover around the stove and constantly check your ingredients looking for just the right time to serve your meal, casseroles can be prepared in stages or even ahead of time. If you're looking for more options, try making a hamburger tater tot casserole or seven layer taco casserole. There are plenty of quick and easy casseroles beyond basic ground beef recipes - try making a turkey and stuffy casserole, a creamy tuna casserole, or even a breakfast hash brown casserole that features sausage. Enjoy!